People are freaking out about War for the Planet of the Apes and its trilogy, calling it the best end to the best trio of movies in film history. Now, that’s just silly, there are a handful of iconic threesomes I can think of off the top of my head that are better (the original Star Wars, Indiana Jones, Back to the Future, Lord of the Rings), and I don’t think this trilogy will be loved 50 years from now the same way those classics I just mentioned are/will be. BUT, the mere fact that those heavy-hitters are brought into the conversation tells you just how good Rise, Dawn, and War absolutely are. I would have called them an underrated group were it not for audiences’ excitement at the release of the latest installment, and now I’ll call them perfectly deserving of most of the praise they are receiving. In Rise of the Planet of the Apes, we meet Caesar and the doctor who made him the super-intelligent ape he is today. We also see how other apes evolved so quickly and how humans were affected by the virus in a distinctly opposite way. In Dawn of the Planet of the Apes, the Simian Flu has wiped out most of mankind, the few who didn’t die fighting each other until only a handful remain. Caesar leads his group, they survive by sticking to the woods, but conflict is coming between them and the human survivors. 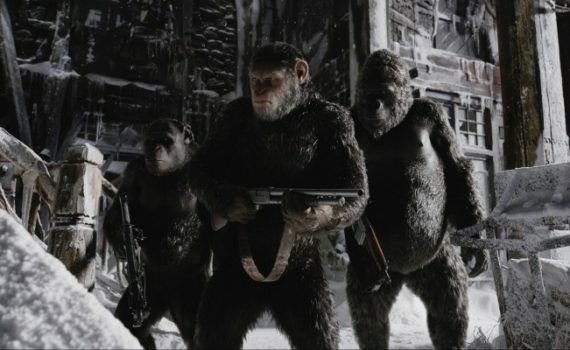 Now, as the story progresses, the armies of the North have come to fight Caesar’s band, to destroy them before apes can take control of the Earth, to make one last desperate grab at dominance before the end. In saying that War isn’t the best movie of the year or that this series isn’t the best I’ve ever seen, I don’t mean to infer that this film and this franchise aren’t spectacular. I was shocked that the first was so good, that Caesar could steal the show to such a degree. I was re-shocked when the second was even better, darker, truer, sadder, and one of the better sci-fi action flicks I had ever seen. Even with such a grand act to follow and the hype that goes with it, the third part is just as strong as the other two, delivering everything we have come to expect and even throwing in a few surprises for good measure. How a reboot/prequel of this magnitude was successful to this degree we may never be able to put into words, but this team was able to take an iconic film universe, flesh it out, and serve it to us fresh in a way that is truly impressive. The winter world was a smart choice, and the symbolism is ripe, a perfect backdrop for the story. That Caesar was split apart from this group and the story was narrowed down was another good decision, allowing for the plot to thicken without having to recycle too much from the previous films. The score was an unexpected delight, music throughout that produced a perfect mood, from pure terror to refreshingly upbeat. There wasn’t much I didn’t like about the movie, actually, although I could find a few flaws were I looking for bugs. I didn’t need the humor, although it was fine, I just didn’t need it to enjoy the film. Woody Harrelson’s part was shockingly small, just like Gary Oldman’s, and I could have used more. The entire thing felt a bit more Hollywood that I expected, the trailer making it look grittier than it turned out to be. 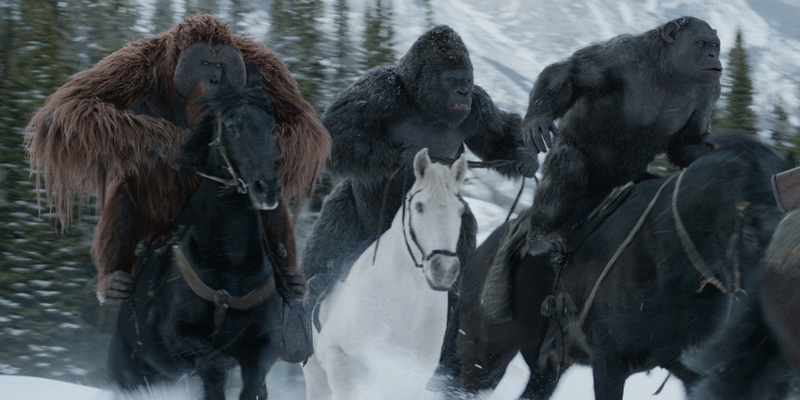 But these are small details, overall War for the Planet of the Apes was one of the most entertaining experiences I’ve had in a theatre this year, and this trio of wonderful adventure pieces should be given full marks for its audacious excellence.